Biosilk is a line of hair care cosmetics offered by an American company called Farouk Systems. It is a series of well-liked products used by professionals. They are often found in many hair salons. This liquid silk aroused interest on the cosmetic market and gathered appreciation and affection of many women. Will the same happen with Maracuja Oil? What ingredients does the cosmetic contain? What properties does the oil of passion fruit provide? Biosilk Maracuja Oil is locked in a tiny bottle. It is only 15 ml. Its main purpose is to moisturise dry, lack of good condition hair. The product contains passion fruit oil (Passiflora edulis Seed Oil), which (just like most oils) contains unsaturated fatty acids that improve the processes within the hair. It is rich in vitamins A, C, K, E and comprises calcium, phosphorus and potassium. Moreover, it boosts the process of hair renewal and provides valuable elements. Additionally, it has a greater potential than the anti-ageing argan oil, due to the high amount of bioflavonoids. It efficiently regenerates hair without adding any weigh. Serum contains a composition of three volatile, harmless silicones which add softness to the hair and allow the valuable substances of the oil to penetrate it. Next on the list of ingredients are: passion fruit seed oil and liquid silk. Therefore, there is no need to worry about their sufficient quantity and concentration. The liquid silk will add shine, moisturise and protect the hair from harmful, external factors. In addition, it smooths the cuticles and closes them. It will also improve the hair styling and treat split ends. The product also contains hydrolyzed protein obtained from quinoa. It provides nutritional and antioxidant properties. This rice (quinoa) is called “the golden grain of the Incas”. It provides high amounts of minerals and flavonoids that are necessary to slow down the ageing processes. Furthermore, after these beneficial ingredients we can find components such as fragrance and potential allergens. However, applied on the hair, should not cause any harm. Keep in mind that it is not advisable to use on skin. The bottle is plastic and contains only 15 ml of the product. In such a small container, obviously, a pump would not fit. 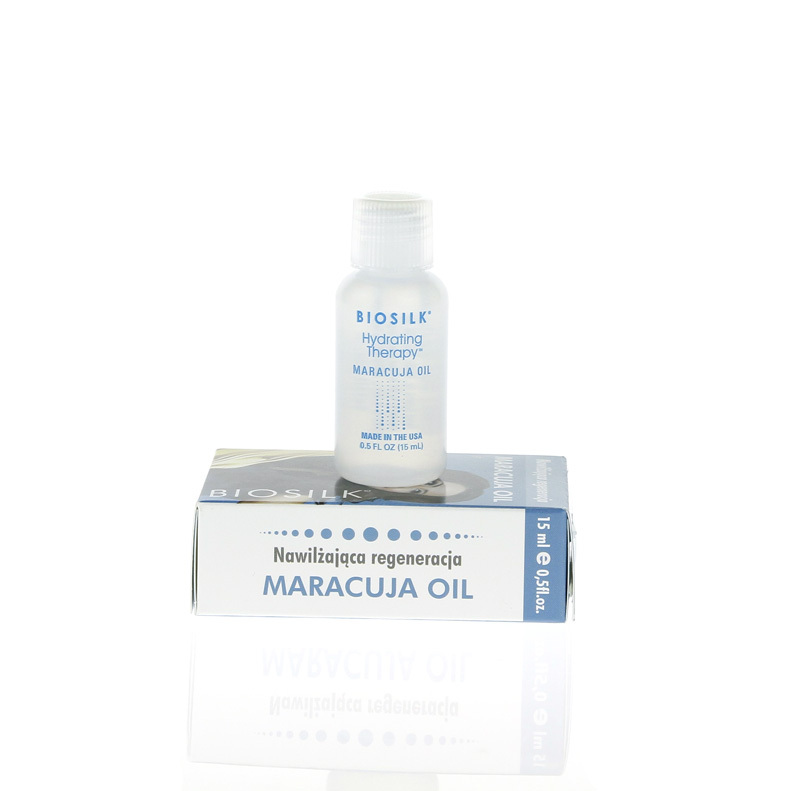 Therefore, Biosilk Maracuja Oil is equipped with a tiny lid only. It is really surprising how efficient the product is, considering its tiny capacity. It will surely last up to two months. More does not always mean better, there is not need to use too much of the cosmetic. A small drop will work wonders on your damaged hair. What is more, due to the compact size, it is a perfect product to take on holiday. It will fit in every make-up bag, luggage or even in your pocket. The application is very easy, and the portable size of the cosmetic will prevent from spilling too much oil on the palms of your hands. Biosilk has quite intense, sweet smell, which is unfortunately, not suitable for everyone. By far, however, the price of the product should satisfy most of us. In addition, it was not tested on animals. The product is designed to moisturise and regenerate dry, tired of styling, hair. It will smooth and tame difficult to style, hair. Additionally, It will be perfect for dull hair without lustre and shine. Rub a small drop of the oil in the palms of your hands and then apply it on dry or damp hair. Do not apply it on the scalp. The oil will moisturise and tame your hair, which is why it is recommended to use before styling.